The Binzagr Factory in Jubail, a 100 per cent Saudi-owned international production and sales company founded in 1978, has entered into a technical agreement with KOSO KentIntrol, a global leader of control and choke valves. The company has diversified over the years with products and services offered locally, across a number of different industry sectors including oil and gas, petrochemical, power and water and mining. "KOSO products complement our existing products and services. KOSO’s first-class technical expertise and professional after-sales service with compliance to IKTVA programme will definitely help in achieving mutual beneficial goals," says Giorgio Foldesi, vice president, Binzagr International Trading Company. "Technical cooperation with KOSO further strengthens our position in the market to support local activities and is also expected to result in greater efficiencies besides significantly increasing our market presence," he says. KOSO has earned a reputation for continuous improvement providing R&D required for engineering challenges. "Our partnership is also looking aggressively to further develop our capability profile by adding more products manufactured by the KOSO Group to our local manufacturing which will definitely help us to increase our IKTVA/NUSANED score and the local market share," he says. The KOSO KentIntrol Valves are available locally at the Binzagr Jubail facility. The Binzagr Factory Jubail has been representing 18 high-tech OEMs from the US, Europe, UK, Japan and South Korea. Last year, Binzagr signed a cooperation agreement with AS-Schneider Germany, the specialist for high-tech industrial valves and manifolds. As part of the agreement, AS-Schneider and Binzagr invested in the Binzagr Factory Jubail jointly manufacturing local content. The facility developed along with machines and testing equipment to suit OEM standards. An OEM-specific QA system was implemented so as to maintain proper standards for the assembly and calibration of AS-Schneider products in Jubail, he says. Through this cooperation, local customers can now access the AS-Schneider’s high-quality products and competent service even faster with inventory stocks locally to serve customer needs more extensively, says Foldesi. 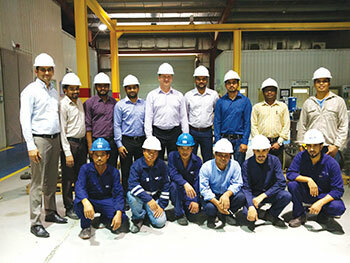 Together with local experts at the Binzagr Factory Jubail, AS-Schneider now manufactures industrial valves and manifold for the valve and manifold technology specifically for use in the oil and gas and petrochemical industries on-site. "We are thus the first local content supplier of instrumentation valves complying with high ISO FE standards in Saudi Arabia," he says. AS-Schneider has already supplied approximately 15,000 measuring assemblies and valves to the Sadara chemical plant in the industrial city of Jubail with a total value of approximately €10 million. "We produce high quality solutions on-site and the local manufactured valves comply with the strict requirements of the ISO FE and thus have the highest tightness class," says Foldesi. This cooperation with AS-Schneider also ensures short delivery times, as well as a flexible and competent technical support: "If necessary, our experts and all spare parts can be delivered to the customer in the shortest time. AS-Schneider products are locally available in the Binzagr Jubail factory from August 2018.